"Amazing sound and technology" - U2's Bono at the 2008 Monte Carlo Luxury Show. Maybe it seems foreseen, but this is really one of the VERY FEW integrated amplifier that respect the meaning of” integrated”. The ALEF Orchestra IS a Duet SE with the new DIRECTOR remote controlled preamplifier in the same box. No compromises are taken, it remains a real Dual Mono conception for both amplifiers with separate power supplies, so is for the preamplifier. This last is a single board, two channels specular implantation of components, mounted on the inner part of back panel to grant no cabling and minimum signal path and it is totally independent from power amp. 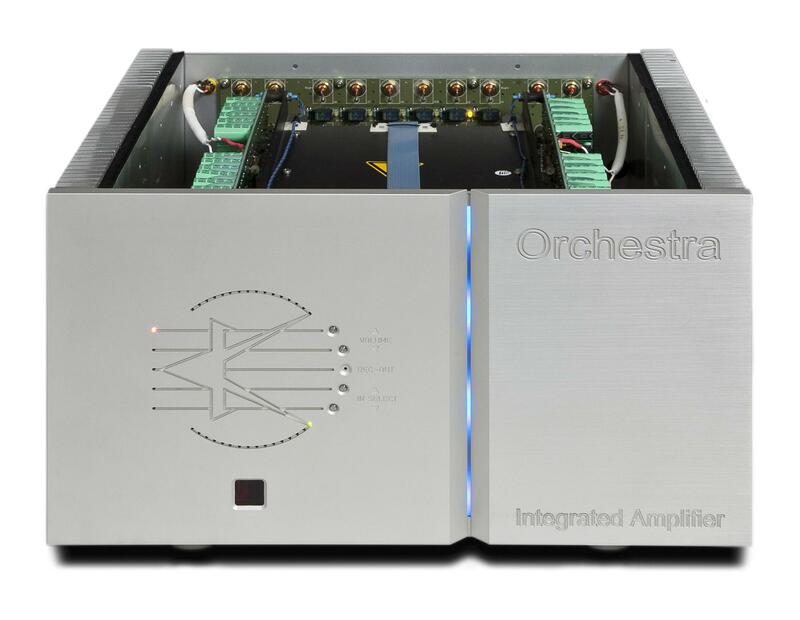 The Orchestra can be used as Preamplifier, as amplifier or as a real integrated preamp and amplifier. We are convinced that this is the best real integrated amplifier in the world! 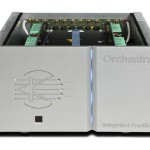 Orchestra incorporates all ALEF Delta Sigma know-how in one single unit, replacing legacy North Pole Integrated amplifier. The single chassis includes Duet SE stereo power amplifier, well known Director preamplifier from Delta Sigma, and new remote control. Orchestra is one box solution without compromise. Integrated amplifier with remote control. “Director” active Dual-Mono Line stage. Remote Control with Ultra-Precise resistor-based attenuator featuring 64-steps. Extraordinary Power Supply for effortless dynamics! Totally stable even on low impedance loads. No special cables & settings required. Substantial anti-vibration technology on power supply. Two massive transformers – 680 VA.
“Planted” in a thick quartz powder for noise shielding & vibration control. “Drowned” in resin within a very expensive mu-metal shielded enclosure. Entire transformer box is “floated & suspended” by several silent vibration blocks. All magnetic radiation and mechanical vibrations are completely suppressed. Litz ultrapure copper internal wire standard – optional silver. Key components are hand shielded with a copper foil and grounded. Very high power reserve is provided by many small fast capacitors wired in parallel and positioned as close as possible to active device. Printed circuit board tracings 4x thicker than standard.